The path to Supai and the Havasu Canyon waterfalls is wide, well-used and somewhat dusty all the way, unless rain has recently fallen. Starting at Hualapai Hilltop, the first part descends the east side of Hualapai Canyon, dropping 1,000 feet quite steeply, switchbacking through whitish rocks of Coconino sandstone then into the red Hermit shale layer near the valley floor. 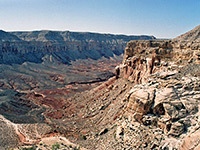 For 1.5 miles the trail has open views up and down the U-shaped canyon, and towards more distant cliffs in the north, though once it meets then follows the dry streambed, this soon becomes enclosed as low red cliffs of Esplanade sandstone form at either side, and the remainder of the hike is within this inner gorge. The wash deepens slowly over the next 4.5 miles (distances marked by wooden mileposts), with no sudden drops, just a steady descent. Near the start, the path short-cuts across a few wide bends but then follows right along the stony streambed, making for easy walking, without any slow, sandy sections. 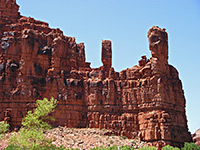 Several minor side canyons join, as the walls reach heights of 400 feet; deep red, layered rocks of the Supai Formation. A few parts are moderately narrow, almost like a slot canyon where the streamway covers all of the floor, though most is rather wide, the watercourse flanked by trees, bushes and sandy mounds. In early to mid morning the initial descent and most of the trip down Hualapai Canyon is in shadow, though all receives full sun in the afternoon, so the return journey and especially the final climb up to the hilltop can be quite taxing. From around 8 am hikers share the trail with mules, who travel typically in groups of 6 usually with several dogs for company, sometimes carrying tourists, other times just equipment. They pass every 20 minutes or so and have priority on the trail - hikers must move aside and remain still until they are ahead. The helicopter is even more frequent at some times of day, passing noisily overhead every 10 minutes. The lower end of Hualapai has a few flat, rocky terraces and residual pools, before the gorge widens and joins the larger Havasu Canyon. Because of Havasu Springs, half a mile upstream, which sustain the year-round flow of Havasu Creek, this 1/4 mile wide canyon is densely wooded, the path always cool and shady, unlike the usually dry Hualapai. The waters have a high concentration of calcium carbonate, causing limestone to be deposited which reflects sunlight so giving the creek its distinctive blue-green color. 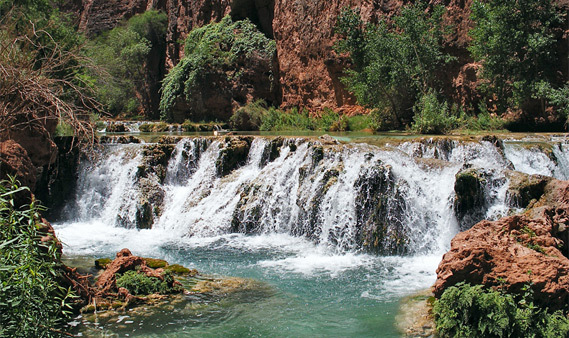 In Havasu Canyon, the creek flows out of sight through the trees as the path follows a parallel drainage channel for a while but then crosses the main river on a bridge, passes up and over a small ridge and, by now quite sandy, drops down into Supai village. This is 8 miles from Hualapai Hilltop, and 2,000 feet lower in elevation. After a few private dwellings, each with horses tethered in the gardens, one of the first buildings (on the left) is the Tourist Office, where all must stop and pay the entrance/campsite fees. Free drinking water is available here, as well as general advice about the canyon. The trail then follows a central route through town, past all the main buildings and various side tracks that lead to more houses, then re-enters woodland on the far side of the village after half a mile. The surface is soft and sandy, and walking is slow. The path stays level for a while then has more of a downwards gradient. Several lesser paths lead off through the undergrowth towards the river and the first two waterfalls (Supai and Navajo), which are hidden behind trees. Havasu Creek comes properly into view just before Navajo Falls, where it flows beneath a rather unstable cliff over a series of pools and small travertine dams, within a corridor of greenery. Several tributaries augment the flow so that as the creek approaches the first large waterfall (Havasu), the flow is quite substantial though occasional flash floods during the summer monsoon season can increase this 10 fold. The vegetation fades away as the path approaches a viewpoint of Havasu Falls, where waters drop 100 feet over a cliff just above the junction with narrow, vertical-walled Carbonate Canyon on the east side. The trail descends on the east side of the creek, then a spur path leads right down to the choppy, deep, turquoise blue pool beneath the falls, and its accompanying cloud of wind-blown spray - a beautiful sight, and a popular place for paddling, swimming or even climbing the slippery rocks right beneath the cascade and diving into the water (something not recommended). 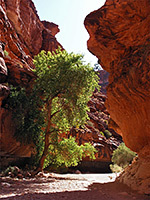 Just below Havasu Falls and 2 miles from Supai begins the extended campground, containing approximately 400 sites (not marked or numbered), beneath willow and cottonwood trees, on both sides of the creek. Drinking water (from Fern Spring) is located 200 yards on the left hand side. 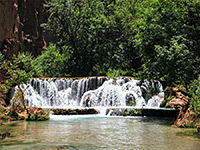 The Havasupai suggest all water has to be filtered but this is not really necessary. The camp has various regulatory notices, including indicating the direction to safe high ground in case of flash floods, but the area is generally very relaxed, and not obviously patrolled. 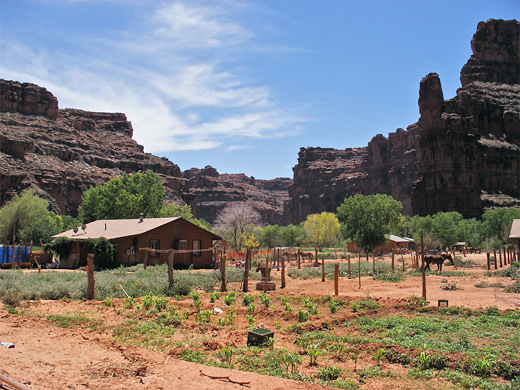 The campground is the furthest point accessible by horse or mule; all travel further down the canyon is on foot only. 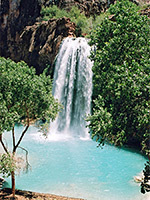 The aquamarine waters next flow over Mooney Falls, the highest in the canyon at 200 feet, where the creek tumbles over an intricate travertine dam spanning the whole width of the gorge. The dam overhangs on top and is sheer-sided below, so the only way down, when a route was first constructed by miners in 1883, was to tunnel through the upper layers then use a combination of ropes, metal ladders and carved steps. The Havasupai Indians never ventured beyond this point. The miner's route has since been improved but remains largely unchanged; it is slippery even when the weather is dry, difficult for children at all times, and may be impassable when wet. Beneath Mooney is a similar sized pool to Havasu, and just as beautiful, without as many people. Even fewer progress any further downstream, where the canyon narrows and the water flows right against one side and then the other, so the route involves crossing numerous times. Paths run on both sides where possible, though they are narrower then before. The creek flows over an enchanting sequence of crystal-clear pools, cascades, small falls and travertine dams for the 2.5 miles to Beaver Falls at the junction with Beaver Canyon, a sizeable west-side tributary. From here, the canyon remains quite narrow for 4 more miles on its way to the Colorado which it joins at the Havasu Rapids, river mile 157. 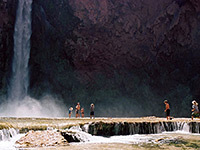 Many people camp at Supai for a week or more, though the minimum stay needed to see all of Havasu Canyon is probably two nights - day 1 to the campground, day 2 to the Colorado and back, day 3 return to Hualapai Hilltop. To see just the main falls would need one night - day 1 to the campground and explore the falls, day 2 back to the trailhead - but single day trips are quite possible. On a hot day in May I walked to half a mile below Mooney Falls and back, a total of 22 miles in 9 hours of which the hiking time was 7 hours. From the Hilltop to the tourism office in Supai took 2 hours, to and from the falls was an hour each way, and the journey back was 3 hours.